First class was too expensive, and third class was beneath them, but too bad. They'd take anything. He only had to wait half a day before a cancellation came - in second class! On the night of April 14th, Al said, he was not awakened by any jarring or grinding (I notice Sylvia said differently in your book, but Al said it simply wasn't true). They were asleep at the time and Al happened to wake up. Something was wrong. He thought and thought and finally realized the engines had stopped. That pleasant vibration was gone. He got up and asked a steward what had happened. The steward said the ship had struck an iceberg, but not to worry, and sent Al back to bed. "Just as I was finally drifting back to sleep, the steward was banging on our door and ordering us onto the deck with our lifebelts," he said. He and Sylvia deliberately kept the new wardrobes in the closet and dressed in their eldest clothes. They wrapped [baby] Alden in only a blanket and left, leaving the gold pieces in the dresser. Soon after, Al said, they began putting passengers out in lifeboats. No one really wanted to go - the flimsy little things did not look safe ... All the while in the mid-Atlantic, people were absolutely horrified at the thought of getting into those lifeboats. Some stokers came up from below, however and tapped Al on the shoulder. "This ship's going to sink," he informed him briefly. "There's no way it can stay afloat. Get in the lifeboat." When recounting this story, Al said, "I don't know why he chose me to tell this, and I don't know why I chose to believe him." But he did. The stoker and the Caldwells piled into boat #13. 2. Julie notes that they left their home in Siam because Sylvia hated it, and her illness was the perfect excuse to leave the country! 3. The stoker mentioned above may have been either Barrett or Beauchamp, who witnessed first-hand the iceberg's affect on the ship. 4. This letter comes with a picture of Mr. and Mrs. Caldwell and their baby. 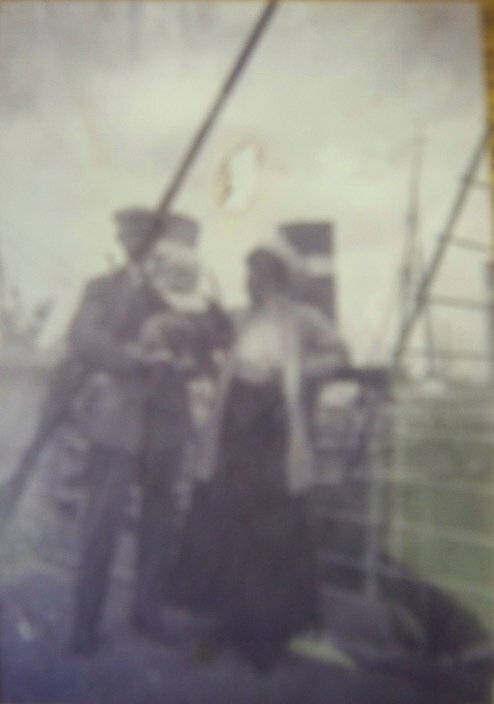 Julie Hedgepeth had confirmed with family members the identity of the people in the picture as the Caldwells had another child post-Titanic. Baby Alden had a deformed finger which helped to identify him in the picture. Julie thinks the picture was taken on the Titanic, and she may be right, if her study of the clothing worn and the weather is right. The picture has never been published in any book on the disaster. It shows the three on deck, while behind them, two funnels of a ship docked nearby or alongside can be seen (the funnels are black with a white band about 2/3rds of the way up). If it is the Titanic, then, given the placing of the masts and a rope ladder nearby, it can be placed on the open-air aft starboard corner of the 2nd class promenade on B deck, near an electric crane (which can't be seen in the picture). To the left of the family there is what could be the gate to the starboard side stair that led to the aft well deck area.